Elizabeth City, NC - Thanksgiving is a time for family and food. However for those in need, the holiday season is an added burden. To help those in need, we need your help during our Stuff The Truck Turkey & Canned Food Drive to help provide Turkey and Canned goods to families this holiday season. 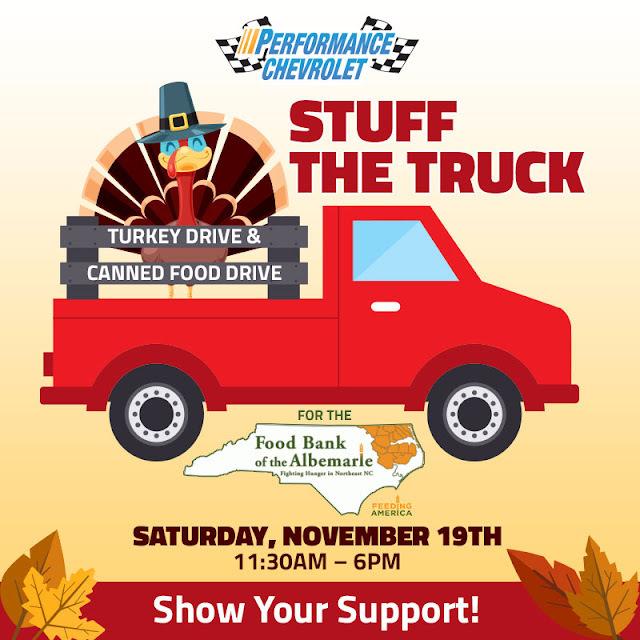 Join the Food Bank of the Albemarle on Saturday November 19th from 11:30-6:00 pm at Performance Chevrolet as they host a Turkey and Canned food drive. For every turkey that is donated Performance Chevrolet will donate an additional turkey to help feed the needy during the holiday season. Performance Chevrolet is located at 1005 W. Ehringhaus St, Elizabeth City, NC, 27909, beside the post office. Stop in for any of your auto or community needs, or feel free to give us a call at (252) 338-9100.